Gather the leaves and shoots (?) of the sayote leaves (the talbos). Chop the sayote fruit in slivers. Wash well and drain. In a hot wok, put some cooking oil and sautee chopped onions. When onions are a little brown, add the ground pork and cook. After 2-3 minutes, add the sayote fruit and Maggi Magic Sarap. 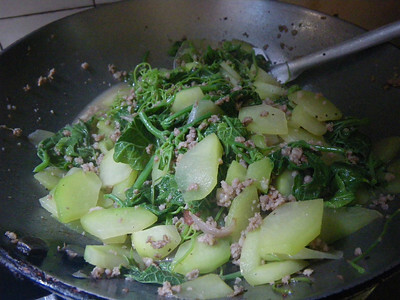 When sayote fruit is already cooked, add the sayote leaves and water and keep stirring until the leaves are cooked (about 2-3 minutes). Adjust seasoning according to taste with salt and pepper. 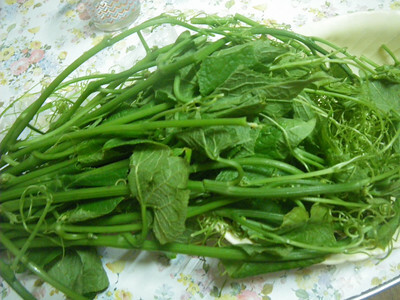 Sayote leaves don't go soggy easily like Kangkong leaves. And it seems to absorb the flavor from the meat which makes it really delightful to eat. 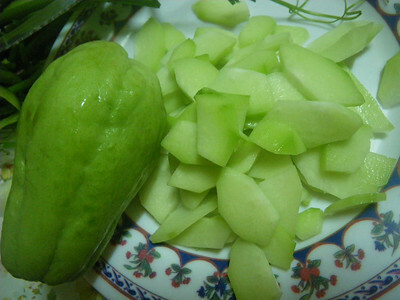 And sayote (fruit and leaves) are rich in antioxidants, Vitamin C and have diuretic properties.